John Cavadini, University of Notre Dame professor of theology and McGrath-Cavadini Director of the McGrath Institute for Church Life, will deliver a theological reflection to the United States Conference of Catholic Bishops (USCCB) during its annual Spring General Assembly, June 14-15 in Indianapolis. The subject of Cavadini’s talk is the baptismal call and the theology of vocation in relation to young people in the Church. At the meeting, the bishops will begin consultation on the 2018 Ordinary General Assembly of the Synod of Bishops convening, which will focus on young people, faith, and vocational discernment. They will also address issues of immigration and refugees, religious freedom, and health care policy developments. Cavadini will deliver a 20-minute reflection beginning at 11 a.m. Wednesday, June 14. It will be followed by a 20-minute question and answer session. Cavadini has served as a consultant to the USCCB Committee on Doctrine since 2006. In November 2009, he was appointed by Pope Benedict XVI to a five-year term on the International Theological Commission and was also created a member of the Equestrian Order of St. Gregory the Great, classis civilis, by Pope Benedict. 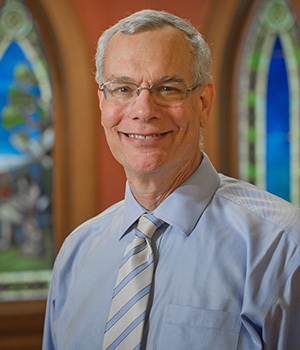 Cavadini served as chair of the Notre Dame Department of Theology from 1997 to 2010. He was named in 2000 as director of the McGrath Institute, which partners with Catholic dioceses, parishes, and schools to offer continuing education and formation for Catholic leaders. The McGrath Institute will host an academic and pastoral conference March 5-7, 2018, in anticipation of the Synod of Bishops. Registration for “Cultures of Formation: Youth, Faith and Vocational Discernment” will begin in the fall. For more information, visit icl.nd.edu/synod. The McGrath Institute for Church Life at Notre Dame partners with Catholic dioceses, parishes, and schools to address pastoral challenges with theological depth and rigor. By connecting the Catholic intellectual life at Notre Dame to the life of the Church, the McGrath Institute for Church Life forms faithful Catholic leaders for service to the Church and the world.